Prepare to be impressed!! Gorgeous custom home on over 1/2 acre lot has been so well cared for! Fabulous curb appeal with circular driveway plus driveways to 2-car main level garage & 2 car basement garage. Step inside the iron doors to a 2-story foyer & open floor plan with gleaming hardwood flooring & high custom ceilings! Chef's kitchen has granite counters, island with breakfast bar, stainless appliances, backsplash, custom cabinets, under cabinet lighting & breakfast nook at the bay window. Keeping room is your place to relax & enjoy surround sound & the stacked stone wood-burning fireplace. Great room with built-ins & 2nd wood burning fireplace plus banquet-sized dining room! 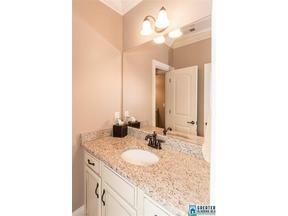 Huge main level master bedroom & master bath are stunning! 3 bedrooms upstairs plus 2 full baths, office and walk-in attic storage. Step outside to a beautiful flagstone patio & outdoor kitchen that includes sink, gas grill, 2-burners, power shades & TV. Full unfinished basement with bathroom stubbed. WOW! !